Copyright and plagiarism and the effective use of Internet resources are vital elements of creative assignments in schools. Access to digital versions of books, magazines, audio and video resources have changed the nature of what a student can do when constructing a school assignment. It has been common practice to ask students to write about a famous person, for example. The writing part may actually be the focus of the assignment. The person being used isn’t the real focus. Typically students get to choose from a batch of people and then gather resources to learn what they need in order to begin writing the essay. A teacher’s common practice has been the recommendation of resources, sending children to the school or town library to access encyclopedias, books, newspapers, etc. A rough draft frequently follows so the teacher can comment on style, grammar, spelling and such along with proper use of quotations with adequate citations. The final draft gets a grade. The Internet has given teachers the task of adding online resources to the mix. That means each teacher must add some online/digital expectations to the assignment and rough draft evaluation. Teachers need to incorporate an honest discussion of fair use, copyright, remixing. The vetting of resources which was once passed off to librarians now must become part of a teacher’s routine. Teachers need to make very few assumptions. Some students will have their own computer/tablet/smartphone and good support at home. Some students will be better than others at search strategies. The assignment needs to become more broad so it can include a student sharing of those skills. Each school year, as student move ahead, the discussion needs to become more rich and nuanced like any other phase of helping studnts learn. With that in mind, a discussion about and use of Open Educational Resources is important. Teachers need to have a good personal understanding of the digital issues involved. Plagiarism has long been part of the discussion. Now, when we talk about copyright compliance, it is not only valuable, but vital to highlight the distinction between restricted and open usage of all the easily accessible materials a student may want to incorporate in an assignment. This is a chance for feedback. 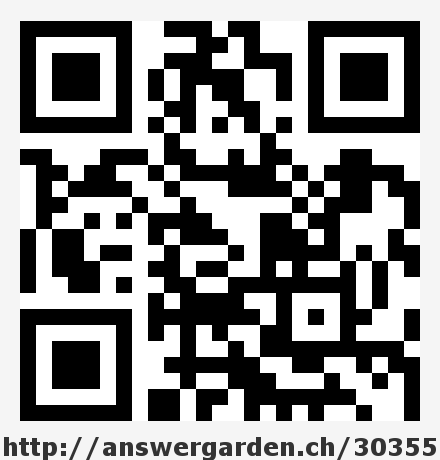 It is also a test of the AnswerGarden tool. Read on to the end for your chance to give a reaction. Their tag line is “Plant a Question, Grow Answers.” They have a live demo. You can visit the site and enter your answer to their self-directed question. 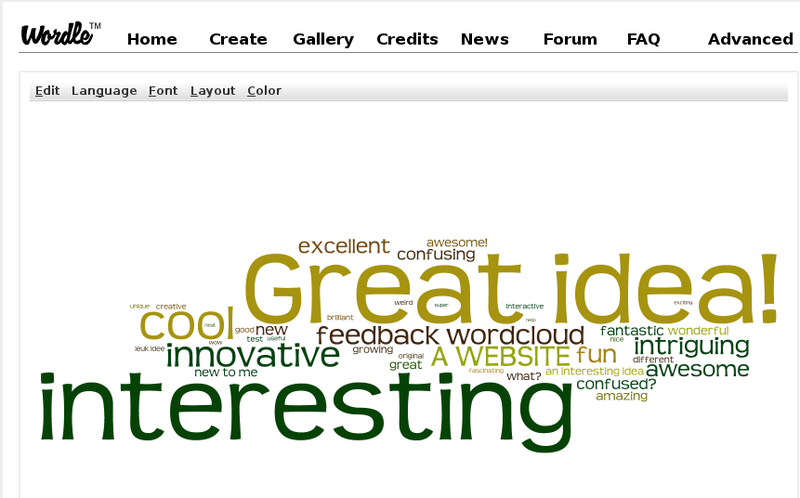 “Answer Garden is…” and as of today, this is what their word cloud looked like. 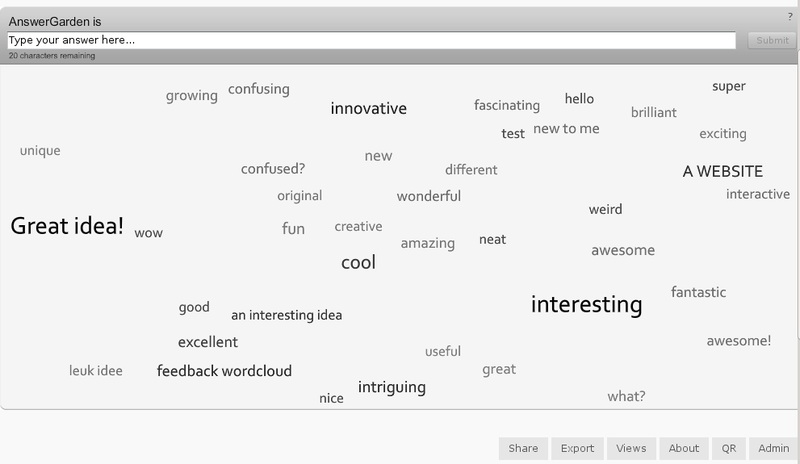 But they have linked out to Wordle, too so you can take the original there and get a fancy word cloud. Wordle allows you to do a whole bunch of format options. You can also export the data to a text file of the answers and their frequency. Import that into a spreadsheet (comma delimited import) and you can then even graph the information for analysis and discussion. You have some simple controls over the input; open, good for class feedback, brainstorming; or limited to one response per day. You can edit the list to make the undesirable/crude responses go away. You can even embed a live AnswerGarden view into your own blog or Web site. The embedding option list is long. You don’t need to embed. Simply provide the link by email or otherwise. They have even built in the generation of QR codes. 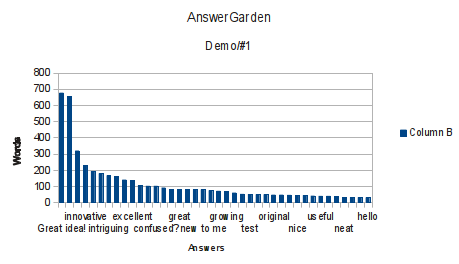 Creative Heroes, the crew behind AnswerGarden sound like a great group of coders. Read their terms of service. Nice. via AnswerGarden: Software Freedom is…. The firm’s research arm StatCounter Global Stats reports that Chrome topped the polls in India, Russia and Brazil, all of which contributed to it becoming the number one browser for that day on a global basis. Looking more closely at these markets shows some surprising variation. In India, for example, Chrome has a massive 45% market share, with Firefox on 32%, and Internet Explorer way back on just 17%. That’s an astonishing 77% for browser that are based around open standards and essentially open source. I’ve just finished taking a look at the future, or at least a part of the future. 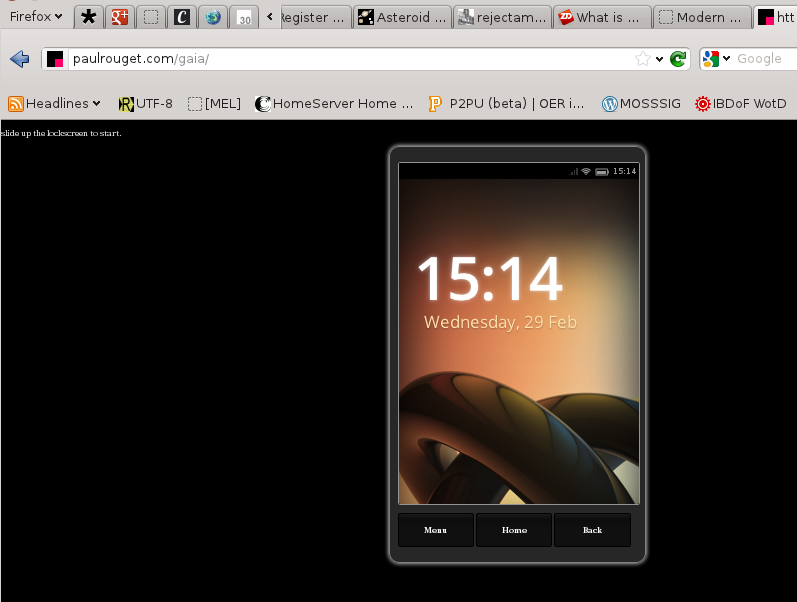 There is an online working emulator of Mozilla’s Boot to Gecko project. You’ll need a recent version of Firefox to explore. 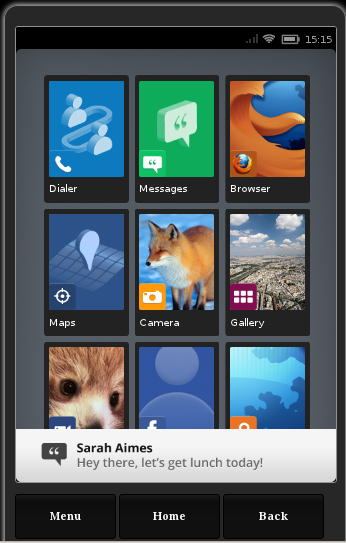 It is a Mozilla project after all and Mozilla is the shepherd of the browser some of us love. I’ll show you some screen shots in a moment, but if you just can’t wait, click the link and, if you remember, come back and read more here later. OK. If I’ve still got your eyes, here’s what I saw. Now remember, this is screen shots on my GNU/Linux/Kubuntu running Firefox 10.0.2. As I understand it, the “apps” are all done in HTML5. That’s the coming Web standard which is slowly being rolled out by Web designers. The first shot shows my browser with several tabs and the opening screen of the emulator. That text in the top left corner says “Drag up to unlock” and a click-drag does just that. Looks like it would be a finger drag on a touchscreen of a phone or tablet just like today’s smartphones. I had to use the feature of reducing my screen image on my 15.6″ laptop screen to get the whole emulator to show in my browser window. The emulator doesn’t have a scrollbar as I’m seeing it. Firefox lets you reduce a screen in the browser by holding down the Ctrl key and tapping the minus key. Ctrl and the plus key reverse that and make things bigger if you want bigger fonts like me, most of the time. I didn’t try everything. I was too excited to get my first thoughts out to you wonderful readers. After an unlock, the main “Menu” screen shows. A moment after the emulator started, the message you see at the bottom of the shot popped up. I haven’t figured out how to clear it, yet. 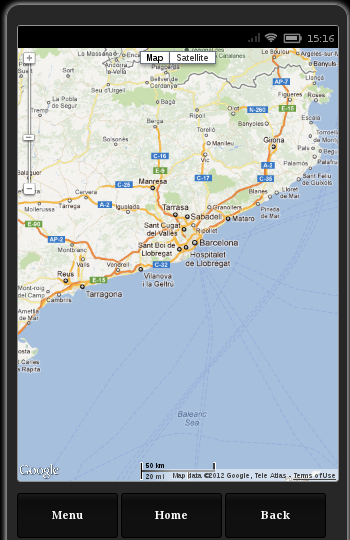 You can click and drag the map around as you would expect from a map from Google Maps. There wasn’t a noticeable delay making a switch from one app to another. On a real smartphone or tablet, this ought to be quick. Here’s the last screenshot. I did this on Leap Day, the 29th of February. 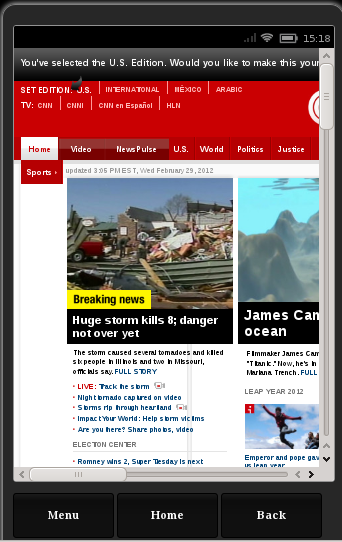 The news is from today in the CNN news “app” running in the Boot to Gecko emulator. This is no mockup. That time showing in the top corner of the emulator is the current time when I took the screenshot. This emulator, and the eventual hardware version, coming on the heels of the KDE Active “Spark” tablet may mean iOS from Apple and Android from Google may soon have some competition. Update: Click and drag the Main Menu screen to the left. There are more apps to try. If you do video with your students, where do you get the music that helps bring the moving images to life? One beautiful example is by Roberta Volpe, Sulla pelle umida which is an MP3 file. If you have a Flash player, a link click will start the 4 minute piece. Right click for saving options. You can also see that the artists have paid attention to more than their music. The image below is the (reduced/cropped) cover art for the song. All the songs at the site are released using the Creative Commons “by share-alike” license. Go take a longer look and listen. What other music resources do you recommend?